A play kitchen can be one of the most important products that parents will buy for their children. The primary purpose of these units is to encourage an active imagination among every user. The best play kitchen includes realistic features such as a refrigerator, oven, microwave, dishwasher, stove, sink, shelves/cupboards, phone, coffee makers, timers, and more. Since these products are sold in a variety of different sizes, shapes, and colors, determining the most appropriate pretend kitchen sets for a particular child may be extremely challenging. Here are the top four play kitchens that are available on the market today. Inspired by the kitchens from the 1950s, the KidKraft Vintage Play Kitchen is the perfect choice for active toddlers between the ages of two and four. Available in several attractive colors such as white, pink, blue, navy, and red, this popular and innovative play kitchen can accommodate more than one child during a play session. The gender-neutral colors are sure to appeal to a variety of preferences such as those of parents, girls, and boys. If you do not want an overly huge play kitchen, this product may be the right choice for your family. The functionality of the play kitchen is greatly appreciated by many children and parents. 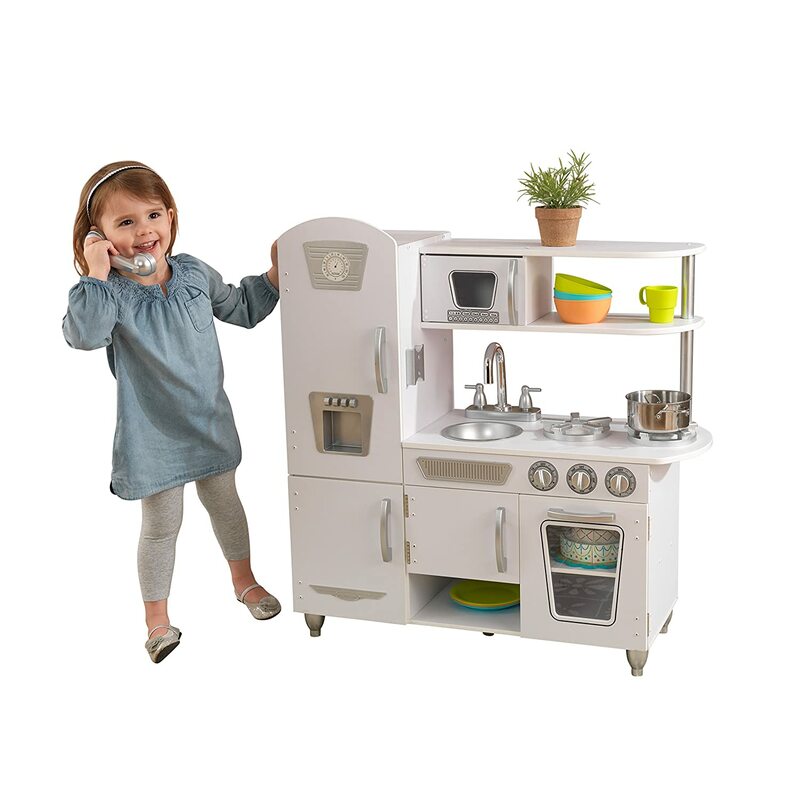 Made of composite wood products, the key features of the KidKraft Vintage Play Kitchen include a cordless phone, two burners, storage cabinet, removable sink, microwave, and oven. The microwave has a turn table, and the sink has a faucet. The refrigerator even has a ice/water dispenser so that children can enjoy a pretend drink at their leisure. They can even prepare a cold drink for mommy, daddy, siblings, friends, and other guests. Every door has a handle, and every knob turns. The oven knobs are designed to simulate a real kitchen as they click when turned. All of the doors to the unit can open and close so that children can engage in a realistic cooking setting. Weighing close to forty pounds, the set is unlikely to collapse when the doors are pulled open. Because the size of the play kitchen is 33 x 11.7 x 35.7 inches, this unit may be too small for children who more than four years old. The product’s compact size enables users to position the play kitchen in a variety of locations including the living room, children’s bedroom, kitchen, dinning room, and play areas. Depending on the color that you select, the play kitchen will easily blend with your existing home decor and furniture. When the product is not in use, you can simply store the unit in a nearby closet or unoccupied corner. Pretend play is one of the most important milestones for young children. By using their imagination, toddlers can improve their speech, develop hand/eye coordination, and stimulate their minds. The KidKraft Vintage Play Kitchen is one of the only products that presents kids with the opportunity to pretend cook and clean. Many parents and educators enjoy this important aspect of the unit. The KidKraft Vintage Play Kitchen is sold pre-assembled, but the product can be assembled in about three hours or less. Assembly is pretty easy as the product includes extremely clear pictorial instructions. The play kitchen includes a wall mount so that the product will not accidentally tumble over on your little one. The KidKraft Uptown Espresso Kitchen is one of the only play kitchens that can accommodate multiple children at once. This modern-styled play kitchen is sure to promote social skills among its users since many children can play at the unit. The product is great for kids who are at least three years old, but most experts wouldn’t recommend the unit for children over seven years of age. The KidKraft Uptown Espresso Kitchen may be the ideal set for those who have multiple children of similar ages or kids in the neighborhood who frequently come over to play. The product offers numerous opportunities for children to use their imagination and fine motor skills. The product’s sophisticated design is a modern twist to the vintage-styled play kitchen. Most customers really like that the play kitchen can blend seamlessly into the furnishings and decor in their house. The product’s dark wood, granite countertops, and stainless steel appliances often resembles the components that are typically seen in an actual kitchen. The unit’s gender-neutral appearance encourages both girls and boys to enjoy this play kitchen. Many customers also love that the play kitchen is similar to a fully equipped kitchen. Some of the highlights of the unit include a convenient storage space, freezer, microwave, fixtures, food prep area, cordless phone, oven, and dishwasher. The functional aspect of the unit consist of turning knobs, opening doors, and a rotating faucet. The chalk board surface on the freezer can be used to display a pretend grocery list or the weekly meals. Another practical feature of the product is the extra storage spaces. Once you purchase the pretend pots, pans, cups, silverware, and other kitchen items, the children will have several options to store the items. The pretend ice maker is also enjoyed by many users. 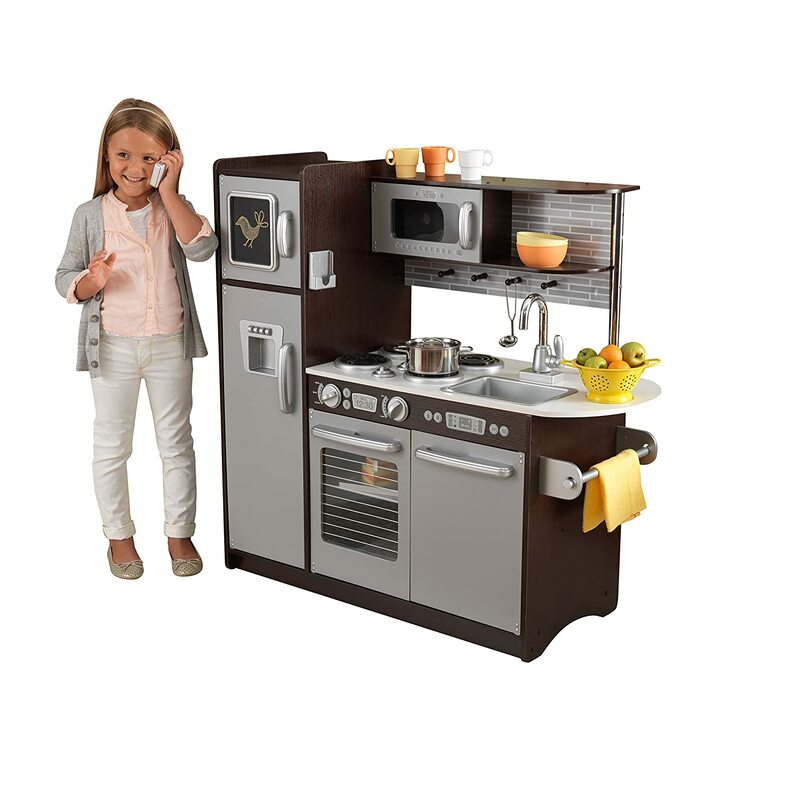 All of the features of the KidKraft Uptown Espresso Kitchen are realistic and interactive. Since the play kitchen is composed of high-quality solid materials, children will not be able to move the product. If the unit needs to be relocated, parents should be able to move the set without any problems. The play kitchen is generously sized; therefore, the assembly time is at least three hours. In order to avoid reassembling the product, it’s probably a good idea to find a permanent home for the unit in one area of your house. The KidKraft Uptown Espresso Kitchen is sold complete with a two-year warranty, but the lifespan of the product is sure to last more than two years. Most customers are able to pass the unit down to younger generations. Play is one of the most important aspects in a child’s day therefore, the Step2 Play Kitchen Set is specifically designed to support the user’s development. Because Step2 is one of America’s largest manufacturer of durable and educational preschool and toddler toys, this renowned company understands the importance of positively stimulating children’s minds during their early growth stages. 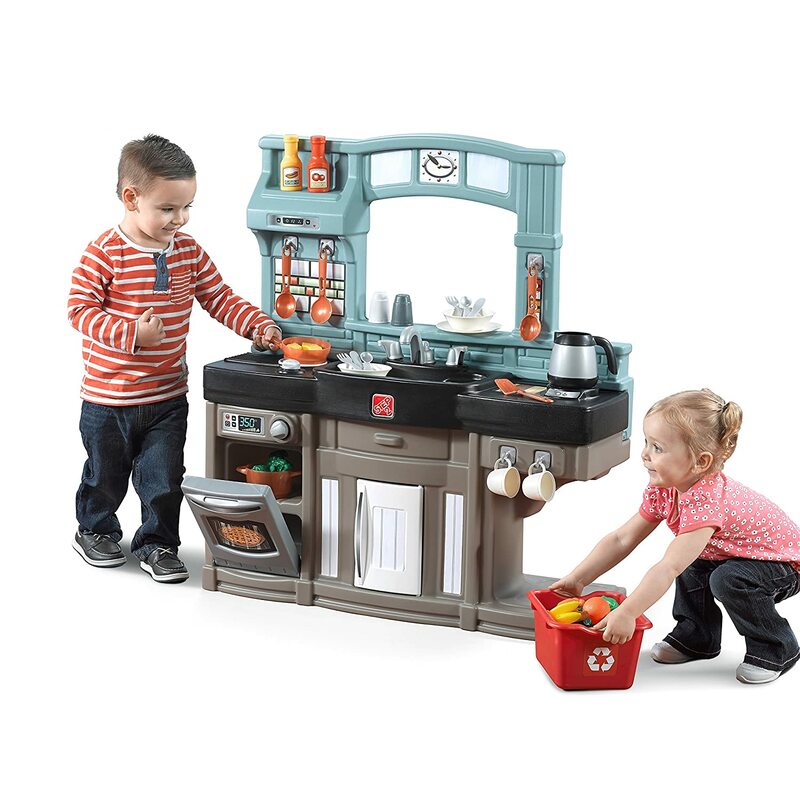 The Step2 Play Kitchen Set is most known for enhancing interactive play and encouraging kids to develop proper social skills as they share the kitchen appliances and accessories with their siblings and friends. Your children are sure to learn important skills when they regularly use this innovative kitchen set during play sessions. Composed of plastic and polyethylene materials, the Step2 Play Kitchen Set contains a refrigerator, pass-through window, oven, generous counter space, stove burner, and ample storage space. While the stove top has clicking knobs, the stove burner has fun lights and sounds. The product is even equipped with convenient hooks to hang utensils and coffee/tea cups as well as carved spaces to stored condiments like mustard, ketchup, salt, and pepper. Also included with every purchase is a 25-piece accessory set that contains cups, plates, silverware, condiments, coffee pot, pots, bowls, frying pan, recycling bin, and several serving spoons. There are a total of 26 items included in the box, but parents can purchase additional accessories. Toddlers will have a blast cooking and organizing food in their pretend kitchen. After using the Step2 Play Kitchen Set, simply wipe the unit with soapy water to eliminate any germs or debris. The Step2 Play Kitchen Set’s practical design and fresh color scheme is a feature that both parents and children will absolutely love. 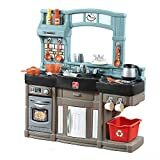 Since the product features blue, black, and brown colors, this pretend kitchen set may be the perfect choice for young boys. However, girls can also enjoy the gender-neutral unit. Another benefit of the product’s neutral colors is that unit can coordinate with virtually any home decor or furnishings. As a result, the Step2 Play Kitchen Set can be positioned pretty much in any room of your house. Many customers have enjoyed the versatility of the play kitchen, which is reflected in the pops of bright colors and fun flair. 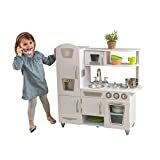 As one of the most affordable pretend kitchens on the market, the Step2 Play Kitchen Set is most known for its quality construction, attractive design, easy assembly, simplicity, compactness, originality, and durability. Many customers also reported that they love the product’s unique ability to support special needs, group/individual play, young children, and creative development. Most importantly, this is probably one of the best toys that encourages children to have fun while learning, growing, and developing important skills. 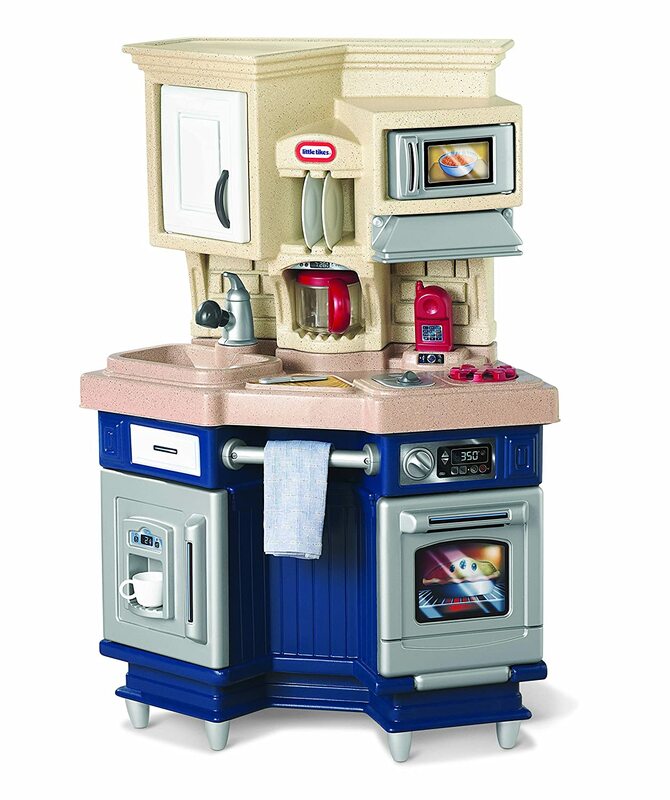 The Step2 Play Kitchen Set is a primarily a USA-made unit, but some of the parts are imported from China. The product is sold complete with a 3-year limited warranty. The unit may require 2AA batteries to produce the realistic sound effects during operation. For those who are searching for a budget-friendly play kitchen, consider purchasing the Little Tikes Super Chef Kitchen. This compact, sleek, and modern pretend kitchen is a great addition to any play area. With a variety of innovative features, children who are between the ages of two and five are sure to enjoy pretend cooking. The product’s multi-color design may attract many boys to the unit, but girls can also have fun creating delicious pretend meals with siblings or friends. The Little Tikes Super Chef Kitchen encourages hours of imaginitative play; therefore, children are unlikely to experience any boredom when you purchase this unit. Made of premium plastic components, the Little Tikes Super Chef Kitchen features a chrome-colored towel rail, fridge, sink, cabinets, ample storage space, oven, and burners. By turning the knob for the burner, the child will activate realistic electronic sizzling and boiling sounds. The refrigerator can hold many different types of food while simultaneously dispensing cold water. The doors to the oven, cupboard, and microwave are also fully functional. The unit is also equipped with a variety of kitchen necessities including silverware, coffee pot, cups, plates, frying pan, and a phone. In order to accommodate most children, the product is sold with legs to add height. All of the components in the Little Tikes Super Chef Kitchen are non-toxic, so children can safely play with the items without placing their health at risk. Although there are a total of thirteen items included in the box, you may need to purchase additional accessories like pretend food and more cookware. Since the product has a compact and triangular-like shape, the unit is suitable for small spaces in your home. Measuring only 28 x 14 x 40 inches and weighing 20 pounds, the play kitchen can be stored nicely in a corner of a room after each use. The product’s blue base, beige cabinets, and tan countertops might even match your furnishings and decor. The Little Tikes Super Chef Kitchen is also suitable for outdoor use, but the product is more likely to fade and become weathered. If you would like to lengthen the life of the product during outdoor use, simply move the unit into a garage or another dry space when it rains or snows. Unlike many play kitchens, this product is pretty easy to assemble. In fact, all you need to assemble the unit is a screwdriver and good work ethic. Most customers will take roughly 45 minutes to connect all of the pieces. Some parents even encourage their older children to install the unit. This is a great task for children who are at least nine years old. Parent supervision is strongly recommended. Once the entire product is assembled, you will notice that the kitchen playset is extremely sturdy. The unit is composed of super durable plastic, so your child can enjoy the play kitchen for many years. After using the product, simply wipe the play kitchen with a dry cloth to remove any dust or debris. Throughout the years, Little Tikes has strived to create products that provide children with a long-lasting, imaginative, and fun experience. Serving thousands of happy customers from around the world, the company is sure that your child will absolutely loved the Little Tikes Super Kitchen. This is an extremely affordable product. In fact, the unit is one of the cheapest play kitchens on the market. The Little Tikes Super Chef Kitchen is made in the United States. The product is sold with a 1-year warranty that protects against unexpected manufacturing defects. The company also offers a thirty day return policy so that you can purchase the unit with confidence. This play kitchen may require 2AAA batteries for proper operation. When shopping for the best play kitchen, you should consider the age of your child. Pretend kitchen sets are available for children as small as 1-year-old, but extra precautions may be necessary. Small children may not be able to reach items near the top of the unit if the play kitchen is too big or positioned on legs. Conversely, play units that are compact may not seem as exciting for older kids. It’s also a good idea to purchase a pretend kitchen set that will actually fit nicely in your house. In general, play kitchens are big units. However, there are many small and compact units online and at retail stores. Always check the dimensions before buying a children’s play kitchen. Most play kitchens are composed of plastic, but the ones that are made of cheap and flimsy plastic should be avoided. The most durable and affordable play kitchens are made of molded plastic or wood. The luxury pretend kitchens are composed of plywood or hardwood. Because of their extreme durability, wood kitchen play sets often become family heirlooms. Since safety is the primary concern for most parents, you want to ensure that the unit is sturdy. The play kitchens that are composed of durable and long-lasting materials tend to be the sturdiest. Many of the best play kitchens can blend seamlessly into your existing indoor and outdoor decor and furnishing. In fact, the pretend kitchens may even resemble your actual kitchen. There are also many gender-neutral products that can accommodate the preferences of girls and boys. Play kitchens have been available in the following colors: grey, white, pink, brown, and blue. Neutral colors are perfect for families who have several young children of separate genders who enjoy playing with a kitchen. Some play kitchens are sold with accessories, but the vast majority of these kinds of products require that customers buy the kitchen equipment separately. The best play kitchen accessories include pots, pans, plates, bowls, cups, and utensils. You can even incorporate a variety of pretend food into the playing experience. If you want to avoid buying extra components, try searching for play kitchens that are sold with kitchen essentials. When shopping for accessories, consider the child’s real-life preferences. Children who enjoy baking cookies may prefer a rolling pin or cookie cutters while kids who enjoy outdoor cookouts may want tongs or basking brushes. Additional essential items like milk, meat, vegetables, plates, and pots can complete the cooking experience. The average time to assemble an entire unit can take up to three hours. If you are buying a play kitchen for Christmas, birthday, or another special occasion, you will want to note the assembly time. You might also want to consider assembling the product before showing the unit to your little one. Most children will become impatient while waiting for the play kitchen to be installed. In general, the wooden play kitchens usually take longer to assemble than their plastic counterparts. The assembly usually requires a simple screwdriver and a little work. Because play kitchens are an investment toy, you will most likely pay top dollar for a high-quality pretend kitchen set. The average cost of a play kitchen is between $60 and $300. Plastic play kitchens are recommend for those who do not want to spend tons of money on this toy. Wooden pretend kitchen sets are designed to last many years, but these products are often costly. Consider your budget before you buy the product so that you will not overspend. Throughout the years, play kitchens have been some of the most popular children’s products for home and preschool use. These products are designed to offer kids imaginitative play options without the hazards that are typically associated with actual kitchens. Parents and teachers alike greatly appreciate that pretend kitchen sets support cognitive and development as children interact with the kitchen and other children. Because these products can entertain kids for several years, it’s an important factor that you select a long-lasting pretend kitchen.